Some of you may know that I'm from Bakersfield, CA. And when I get a chance to get back there we oftentimes have Old School Barbeques. O.K. the Old School is primarily me making a Barbecue for my parents and siblings. So, here's one of the easiest, tastiest versions of making BBQ Chicken and Ribs that I know. This process and recipe uses an old barrel type height adjusting grills similar to what I use in the suburbs. My grill doesn't have as much wear and tear or as we say in Bakersfield "seasoning" but it gets the job done. 3. Cover both sets of meats and place in the refrigerator for at least 40 minutes. 4. While meat is marinating in the refrigerator prepare the grill by cleaning off any excess Que leftover from previous Barbecues. 5. Layout the charcoal in the grill without starting. 6. Take Grape vines stems or Hickory Charcoal chips and soak them in water while the meat is marinating. 7. After 40 minutes of marinating in Yellow Mustard remove the meats from the fridge. 8. Coat the chicken with Tri Tip Rub and the Beef Ribs with Santa Barbara Rub. You can massage in the rubs to get deeper flavor. 9. Return each meat to their container, drain off any excess liquids, cover and place back in fridge for 40 minutes to 1 hour. 10. Start the charcoal either with a charcoal starter or with by using Matchlight charcoal. Let the charcoal burn until the meats are marinated. 11. After 40 minutes or 1 hour remove the meats from the fridge. 12. The charcoal should be almost ashed white by this time. 13. Pull out a long strip of Aluminum foil and place over the center of the grill. Be sure to leave space on all sides of the foil so that air can pass between the grill and foil and so that we don't snuff out the burning charcoal from lack of oxygen. 14. Spread a thin layer of soaked grape vine stems or hickory wood chips over the charcoal. Be careful not to get burned in the process. 15. Coat the foil carefully with Olive Oil or Vegetable cooking spray. 16. Place the chicken quarters with the primary meat side down on the foil first. The same applies to the beef ribs remove from the pan and place meat side down. 17. Cook on the foil for about 30 minutes. 18. After 30 minutes raise the lid on the grill and turn both meats over. 19. Sprinkle another layer of grape vine stems or hickory wood chips over the charcoal for additional smoke. 20. Close the lid and cook an additional 30 minutes. 21. After 60 minutes of cooking remove the foil from the grill. Be careful to fold the foil over at the corners. There will be fat which turns into grease and if it leaks through the grill it will cause a grease fire. If you don't have water spray to put the fire out, close the grill lid and close all air vent bottom and top. Once the fire is out slowly open the vents to keep the charcoal burning. 22. After 10 minutes turn the Chicken and the ribs. 23. Use a meat thermometer to determine the temperature of the chicken by piercing the thigh all the way to the bone. We like to cook to 170 degrees which we believe is safe but you can decide what's right for you. The beef ribs should be very good at 150 degrees. 24. 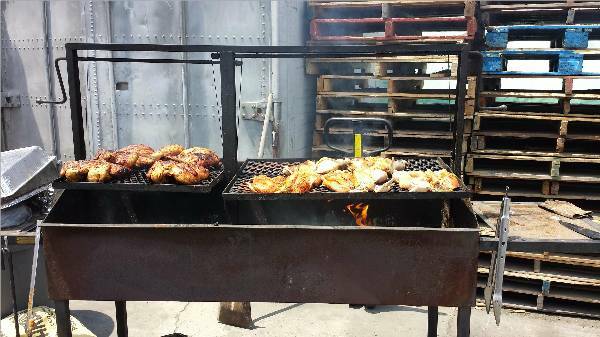 The method of Old School BBQ Grilling ensures that the Chicken will be extremely moist and flavorful. Once done remove both meats and let rest in a pan for 4-5 minutes before serving. Learn more about Global BBQ and how we did it in Bakersfield through our eBook From Bakersfield to Barbecue - A Global View.